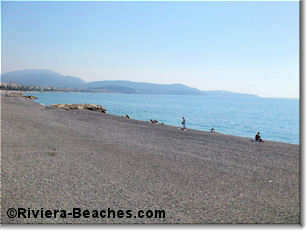 Fabron public beach is a nice compromise between the somewhat crowded beaches near the center of Nice and the farther flung beaches of west Nice. You're far enough from the airport not to be bothered by noise yet within easy reach of snacks and public transport. Fabron beach is wide and long enough to accommodate two beach restaurants: Miami Beach on the western end and Bambou on the eastern end. But don't worry, there's plenty of room to throw down your towel for free. There are two good budget options at Fabron: Quality Suites at the western end and an Etap hotel at the eastern end. There are no particular safety issues with this beach other than the fact that there's no lifeguard and the first-aid station is about 200m further to the east at Magnan. See more about lifeguards. 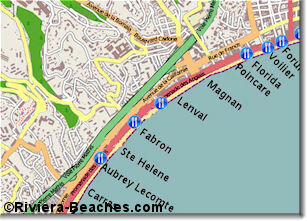 There is limited hourly parking available on the Promenade des Anglais but it's best not to count on finding a space. Otherwise, go inland a few blocks, taking the street from Miami beach, and you might find free street parking. At the eastern end of Fabron, there are indoor hot water showers (€1.60), left luggage and a WC (€0.60). Convenient! The Fabron/Musée d'Art Naif bus stop is on the Promenade at Miami Beach. You'll find buses 8, 11, 52, 59, 60, 70, 94, 98, 200, 230, 400, 500. See more on buses in Nice. Aside from dining or snacking at Miami or Bambou beach restaurants, you can pick up sandwiches and snacks at a boulangerie on ave de la Californie. There's also a small Carrefour supermarket, a small cafe and a fruit stand. Take the street leading inland from Miami beach.